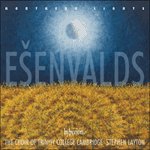 The afterglow of Ešenvalds’ engagement with the Anglican choral tradition, as could be experienced on a daily basis during his time in Cambridge, can be heard in Psalm 67, premiered by Stephen Layton and Polyphony in Amsterdam in 2012. Twice a solo baritone chant replete with the characteristic cadence of countless versicles (a deliberate allusion or an unconscious borrowing?) is answered by the full choir in chordal writing of questing, shifting tonality. This is the most chromatic music on this recording—a music of mingled praise and apprehension. At the close of the piece the baritone’s chanted melody returns, again with its occasional octave doubling by sopranos and altos—an especially subtle bit of voicing—but this time anchored by a sustained chord of E flat. The last word of the piece is simply ‘God’—the voice of supplication distilled to a single syllable. Let the people praise thee, O God; let the people praise thee. O let the nations rejoice and be glad, for thou shalt judge the folk righteously, and govern the nations upon earth.